The newest addition to the traffic camera images available on our website offers you another eye on Stevens Pass traffic conditions. Those who figured out they shouldn’t have ignored the signs and stop in the middle of the lane to put on their chains (and cause a chain reaction of cars that had to stop and can’t get started again). It makes it pretty obvious why we wanted a camera there – it gives us and the State Patrol a new tool so we can respond more quickly and with the right equipment and crew members to deal with whatever is happening (an avalanche, slick pavement, a collision, stuck cars or a sideways semi). Besides the new camera, the original Stevens Pass camera that’s been on the web for a dozen years, moved last Friday, and so did the view it provides. You may recall that we’re building a pedestrian bridge over the highway at the summit. It’s almost done and the old location of the camera and weather station on the shoulder of the highway at the west end of the ski area parking lot is now under several tons of concrete and steel – the north bridge support and ramp. The weather station building with the tower on top where the camera is located got moved several hundred yards to the east end of the ski area parking lot, next to the highway shoulder. As a result, the camera is now facing the opposite direction from where it used to. It points back (west) toward the summit showing the pavement, the parking lot and the new bridge. For our maintenance staff, those are the things they need to monitor, but it can be a little confusing since the west view camera that we added a couple years ago is (obviously) also pointed west. (It’s located under the eave on the west side of the Stevens Pass Ski Lodge and shows the pavement and the ski area parking lot on the southwest side of the highway.) It also now shows the new right turn lane into that parking lot that we also built this summer. That has been a problematic (read “get stuck here”) access for years so our plow drivers, Incident Response Team members, State Troopers and ski area parking crew members are all looking forward to a winter without the spinouts and stoppages, there. The new $6,500 camera installation was paid for with WSDOT “low cost enhancement” funds (from our gas taxes). It brings the number of traffic cameras in the WSDOT’s North Central Region to 30 (If you go to the North Central Region camera page, there are 32 images, but two of those aren’t WSDOT cameras - Downtown Leavenworth and Waterville). 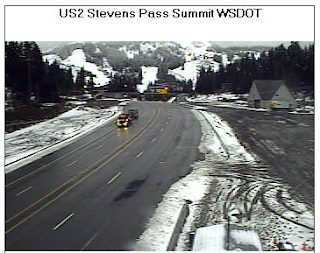 Eleven years ago, the region installed its first traffic camera at the summit of Stevens Pass. Statewide, WSDOT offers 400+ traffic cameras to help motorists “Know before you go”. Check out the new camera and bookmark it if you’re Stevens Pass skier, since the slopes should be ready for you by Thanksgiving. Tolling starts on the SR 520 bridge in spring 2011: How will you pay the toll? You might have heard that all-electronic tolling on the SR 520 bridge begins in spring 2011. This means there will be no toll booths, no stopping and no hassles. Not familiar with Good To Go!? It’s Washington state’s electronic toll collection system that lets you pay tolls without stopping. It’s the easiest and cheapest way to pay your toll. Drivers with Good To Go! passes will have the amount deducted from their prepaid account as they drive across the bridge. To give drivers more options, we recently announced new Good To Go! toll passes. There’s a wide range of options available, from a permanent sticker to movable and specialty passes. Check out the new passes and get more information including prices. Once you buy a pass and set up an account you’ll be able to use it on the Tacoma Narrows Bridge, SR 167 HOT lanes and SR 520 bridge next spring. We’ll photograph the license plates of those who don’t have a Good To Go! account and send a toll bill in the mail to the registered owner. While toll rates for the SR 520 bridge have not been set, you can take a look at range of toll rates being considered (pdf 123 KB). Tolls will vary by time of day and you’ll pay the lowest toll rates if you have a Good To Go! account. The Washington State Transportation Commission will make a recommendation on toll rates later this fall, and a decision is expected in early 2011. Watch for public hearings to share your thoughts on the proposals. To give drivers an alternative to paying the toll, King County Metro and Sound Transit have started adding nearly 130 bus trips a day across the SR 520 bridge. These service enhancements, along with park-and-ride and bus stop improvements, will give you more travel options when electronic tolling begins in spring 2011. So, now that you know your options you have some time to think about what works best for you. Starting in January we’ll begin offering incentives to sign up. Be among the first to know about the special offers by signing up at for e-mail updates. 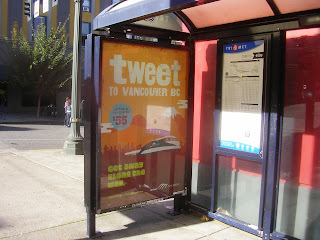 of this campaign, "Tweet to Vancouver B.C." of the campaign highlights both an activity passengers can do on a train, as well as a specific destination—in just three words (ex. “Eat to Vancouver B.C.”, “Text to Olympia”). The campaign tag line "Get Away Along The Way” conveys how Amtrak Cascades allows people to have fun and relax while they are traveling, versus having to wait until they reach their destination to start enjoying themselves. The ads are out in the Seattle, Portland, and Vancouver, B.C. metro areas and you can see them locally here in Seattle on Sounder trains, Sound Transit Link Light Rail, outdoor billboards (downtown Seattle billboard tri-vision at Valley & Fairview), and on-line at KING 5 news, Weatherbug, and KOMO News. Or listen to the radio spot (mp3). Let us know what you think about the new campaign! UPDATE: Wi-Fi is coming on-line on board Amtrak Cascades in December. We are finishing up the testing phase to make sure it is working correctly and will launch the service as soon as that is completed. So you will be able to YouTube, Skype, Tweet and more on Amtrak Cascades! The AAA Foundation released a major report on Parents and Teen Drivers this past Tuesday. This was the first naturalistic study that observed the interactions of parents and teen drivers during the learner stage of driving using in-vehicle cameras which were mounted the dashboard. The study found that while many parents do a good job of providing good advice, the wasn't enough practice time overall and specifically there wasn't enought practice in different conditions such as heavy traffic, incliment weather or driving at night. This is an important message for parents of teen drivers to hear because there is absoulutely no substitute for practice when it comes to driving. Footage from our study was used by a variety of news shows including on NBC's Today Show and ABC's World News with Diane Sawyer. A year ago a landslide destroyed a stretch of SR 410 and now our work to reopen the roadway is being recognized nationally! The Nile Valley Landslide project is one of ten transportation projects selected by AASHTO (American Association of State Highway Transportation Officials) as a finalist for this year’s Best Transportation Project in the U.S.
What we need from you is to continue to vote so we can win the “People’s choice Award.” This award is solely based on the number of votes we receive. Currently, we are one of the top two projects. In order to win $10,000 to give to the local community who was incredibly impacted by the landslide, we need you to head over to the America’s Transportation Award website and cast your vote. Feel free to cast your vote every day as many times as you want. Help us win this thing! Due to state budget reductions, we will be closed on Monday, October 11, and employees will be on temporary layoff status. Regular service will resume on Tuesday, October 12. See you Tuesday. Think fresh, brisk air, a chance to get outside, early morning and a backpack. Do you remember walking or biking to school as a child? My most recent memories are from when I biked with my son to school. This Wednesday, October 6th is International Walk to School Day and thousands of children will be getting that same experience in celebrations throughout the state. For some families, it will be a chance to give walking or bicycling to school a try for the first time. You can do your part even if you aren’t walking or biking to school by driving carefully and watching out for children who are on their way. Walking and bicycling to school happens throughout the school year but Walk to School Day celebrations are designed to make this retro activity more festive. The combined effect of childhood obesity, traffic congestion, environmental pollution and rising fuel prices have lead to schools and families rethinking how children will take the daily trip to school. They have embraced the concept and are using funds from sources like the Safe Routes to School Program to help increase the number of children walking and biking to school safely all year. 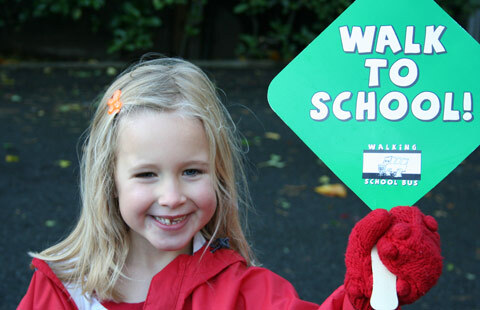 For more information about the Safe Routes to School Program go to http://www.wsdot.wa.gov/localprograms/saferoutes/. Walk to School Day is not a new initiative. In the U.S., it started in Chicago in 1997, modeled after the United Kingdom’s walk to school events. This year Walk to School Day is expected to include 5,000 schools from all 50 states. Walkers from the U.S. will join children and adults in 40 countries around the world. I enjoyed biking my son to school because it gave us something fun to do together in the mornings. It was also a great way to wake myself up before the work day. Whatever the motivation, Walk to School boils down to support for healthier families and safer communities. For more details and to see who’s walking this year, visit www.walktoschool.org. We don’t cut the ribbon on a community planning document in the same way we celebrate the opening of a new bridge or highway. 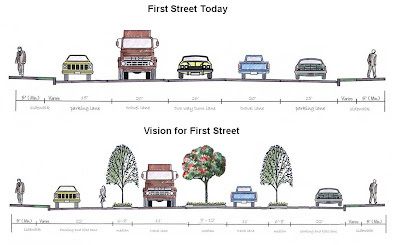 However, as a Certified Planner working for WSDOT, I have seen proof that these community planning processes make a significant difference in transportation and in our cities, towns and communities. This month we are joining the American Planning Association in recognizing October as Community Planning Month. So what exactly is community planning? Community transportation plans help to identify affordable short-term improvements like signal timing adjustments, new crosswalks, and better signage. These plans also help by creating long-term visions and action plans for some of our most congested corridors. They tie all the different parts and pieces of our system together like county roads, city streets, rail, highways, ferries, buses, sidewalks and trails. 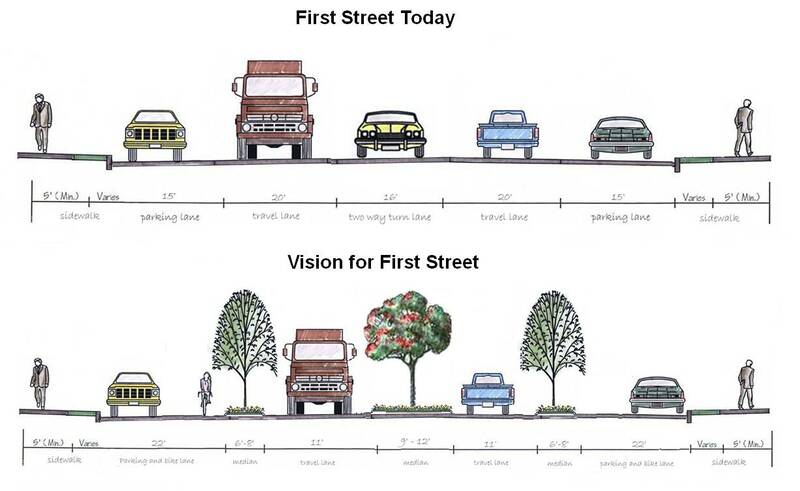 During a recent community planning process I held with Washington APA in Cle Elum, residents envisioned a more walkable downtown by re-designing State Route 903. Working together with other planners, architects and engineers, we generate a concept based on their ideas. Our work produced a common vision and identified steps to construct it. 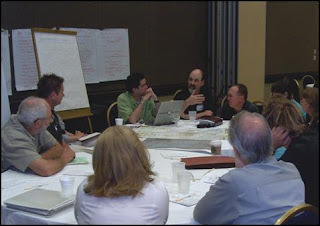 I think of community planning as being a lot like mediating family disagreements – only with more people, more disagreements, and a short timeline. During these planning workshops, I work with groups of neighbors, elected officials, business owners and others to find common ground and build an action plan for making it happen. Community planning saves money by uncovering efficiencies and bringing to light information that may not have otherwise been considered – things like freight patterns, school traffic, planned developments, local preferences, and the list goes on. Another example comes from Woodland, WA. During development of a community plan, residents found that roundabouts at the intersection of a local street and highway off-ramp would reduce traffic congestion, while at the same time create the entrance they wanted for their downtown. This improvement could save millions by eliminating the need for a much larger intersection improvement they originally thought was needed. At whatever scale and whichever agency leads the process, community planning helps jump start short term projects, support sustainable economic development, uncover efficiencies, and even identify funding partnerships. Help us out during Community Planning Month by sending your recommendations or vision for transportation in your community to WSDOT Community Design at Reevesp@wsdot.wa.gov or by calling 360-705-7258. You can also participate in your local community planning processes by contacting your local elected officials or your city or county administrator’s office.